I’m finally taking Ari’s advice to heart and writing a capoeira journal. I have tons of notebooks all over the place, but I lose them or get them mixed up with my other notes. I think blogging about it will make it easier for me. First time doing a pull up. I was inspired by a blogpost I stumbled upon on Art of Manliness and decided to go for it. I was I was at the academy taking a break by a horizontal bar and just pulled myself up. This is certainly not something I could have done a year ago. Next step is trying to do 2 in a row. Looking to build upper body strength in general so I can do queda de rins into a tesoura, like we were doing on Tuesday night in class. First time doing a handstand away from a wall. After Ari giving me a valuable tip of folding my body more and getting my feet closer to my hands before I go up, I was able to go up into a handstand. It seems that the trick is thinking more about up, rather than forward. Forward is fine for doing a handstand on a wall, where the wall is there to catch you, but up is where it’s all about. Another lesson learned this week, Grilo taught us how to do a tesoura while guarding the family jewels. Valuable tip indeed. Curious about capoeira? 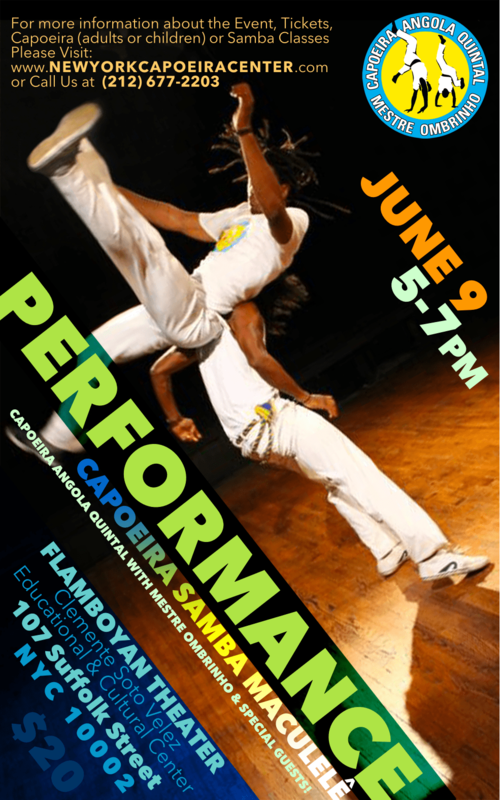 Join us at the New York Capoeira Center.